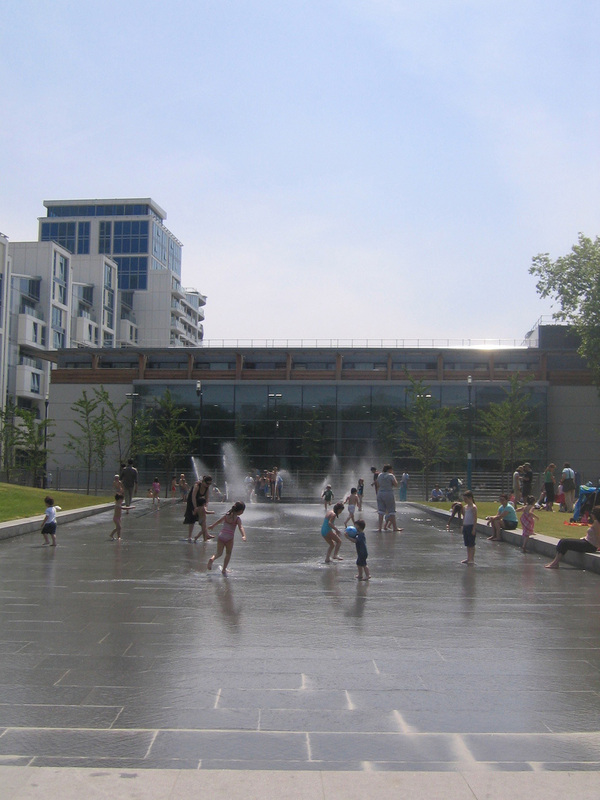 This park eloquently weaves together the evolving cultural and recreational needs of this diverse neighbourhood and is one of four interlinked landscape projects by Gustafson Porter + Bowman on this site, including: the Swiss Cottage Library entrance, the Eton Avenue market, and the Leisure Centre landscape. Co-ordinating these related projects and new architectural elements, the park transforms a collection of loosely related functions into a coherent communal setting with an elevated sense of place. At the park’s heart is a water feature intended for play as well as visual drama. Jets set at thirty-degree angles emit 15m-long streams of water arcing over the rectangular basin. In addition, a thin sheet of water emerges from grilles set into the paving at the fountain head and courses down a rectangular, sloping granite plane embedded into softly stepped grass banks. The scheme also provides a shallow pool at the northern end of the feature which can be cleared by activating drainage valves, creating a dry paved surface. In this mode, the garden can be used to host special events in collaboration with the Hampstead Theatre and Central School of Speech and Drama. A borehole sunk deep into the chalk subsoil provides water for the basin - it is treated in an underground plant room and then pumped into a holding tank where it can be drawn off into the water feature holding tank or be used for irrigation and street cleaning. Water is constantly re-circulated with new top-up water from the borehole to compensate for evaporation. The presence and absence of water suggests activity and tranquillity with equal ease. A strongly moulded land form, together with lush planting, provide a striking context for the water element. Throughout the site, the juxtaposition of ground levels offers opportunities for performance (athletic or aesthetic) and observation at varying scales. Two cross-axial pedestrian paths link the major venues that enclose the open space, dividing the site into unequal portions. Lines and groves of trees reinforce the scheme’s organisation, framing circulation and major open areas. 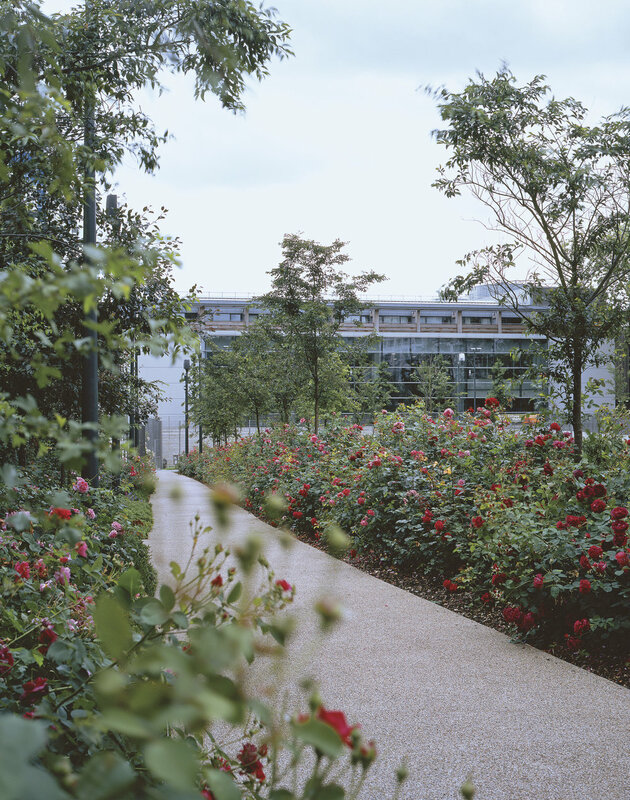 A sunken sports pitch clad in reclaimed Portland Stone salvaged from the old sports centre façade is located at the southern edge of the open space. With an aspiration to create an open space that is functional, progressive, and poetic, the design looks to the future of Swiss Cottage.